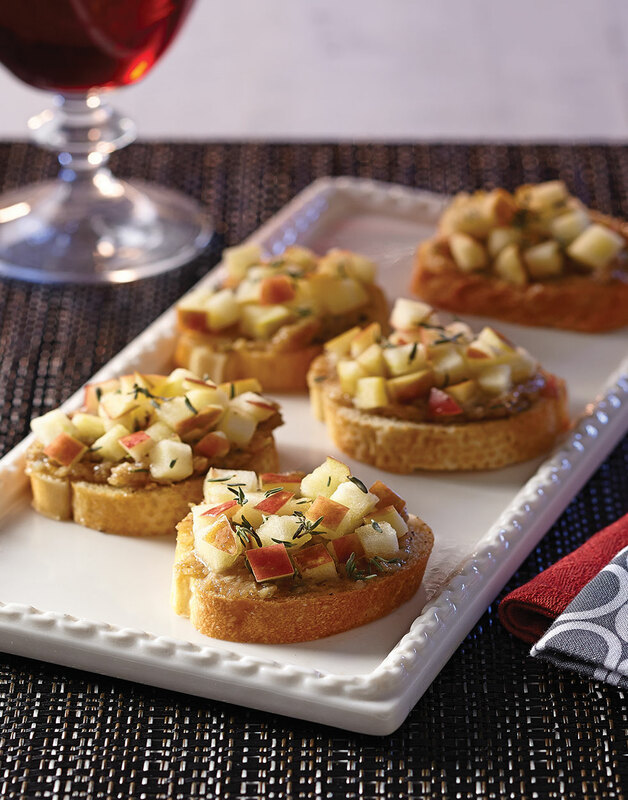 These tasty, crisp crostini with roasted garlic and walnut spread, and diced apple are perfect as a side dish or appetizer, and work equally as well as a decorative and delicious garnish on the Creamy Garlic Soup. Preheat oven to 350°. Halve garlic bulb horizontally, then lightly drizzle cut sides with olive oil. Tightly wrap garlic, cut sides up, in foil. Roast garlic until tender, 30-40 minutes. Let garlic cool, then squeeze the cloves from the skins. Brush 1 Tbsp. oil on one side of baguette slices; season with salt and pepper. Bake baguette slices on a baking sheet, oiled side up, until crisp, 10–12 minutes; let cool. Purée roasted garlic, walnuts, remaining 1 Tbsp. oil, thyme, and vinegar in a food processor; season with salt and pepper. Spread roasted garlic mixture onto crostini, then top each with 1 Tbsp. apple.